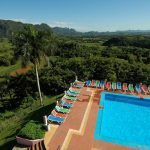 As a relatively small, compact country, one of the many joys of taking a holiday to Belize are the short travel distances involved as well as the sheer ease of travel. On my most recent visit to the country, my first internal journey, from Corozal to Caye Ambergris, took under an hour. Ok, you’re thinking, an hour’s journey between locations is hardly anything to get too excited about? But what if I told you that the journey in question included a domestic flight? 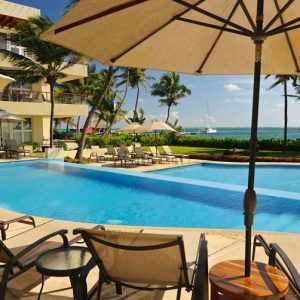 The precise journey in question was from the Almond Tree Resort in Corozal to the Phoenix Resort on Caye Ambergris. Although the flight was scheduled for 10.30, the hotel assured us that we could get a taxi at 10.00 and still have time to spare. 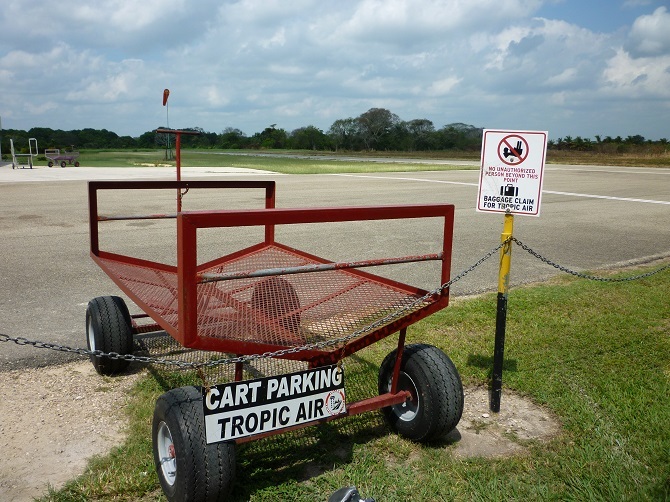 So, sure enough, our taxi turned up at 10.00 and by 10.05 we were sat at the Tropic Air shed (sorry, terminal) at Corozal airport. Check-in? As soon as we arrived, our bags were taken from the car and plonked down on a waiting baggage cart without being weighed, checked, screened etc. Squeezing into the shed of a terminal the man behind the desk gave a quick smile, said “Kelly?” and handed over our plastic boarding passes. Done. With no security, no shops, no anything really, we spent the next 10 minutes sat on a picnic bench outside the shed chewing-the-cud with our taxi driver who was waiting for a pick-up from the inbound flight. 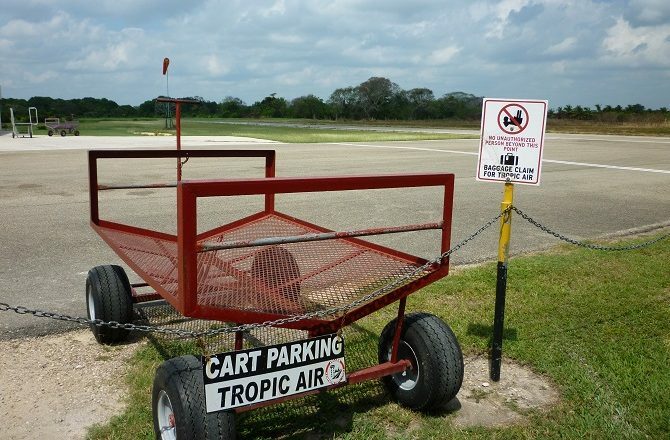 At around 10.25 our Tropic Air plane arrived, almost without noticing, and within 10 minutes we were on our way. 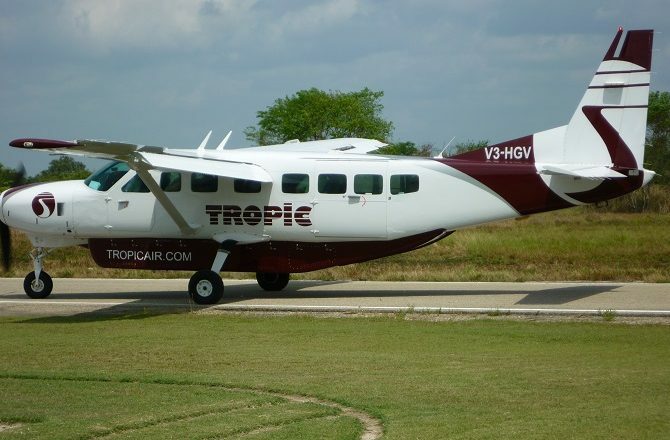 Flying time from Corozal to Caye Ambergris? 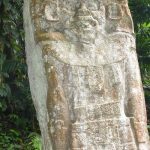 Well, that was all of 15 minutes but it was such a scenic journey – flying over Mayan ruins, untouched mangrove swamps and then the turquoise Caribbean waters – that I only wished it could have lasted longer. 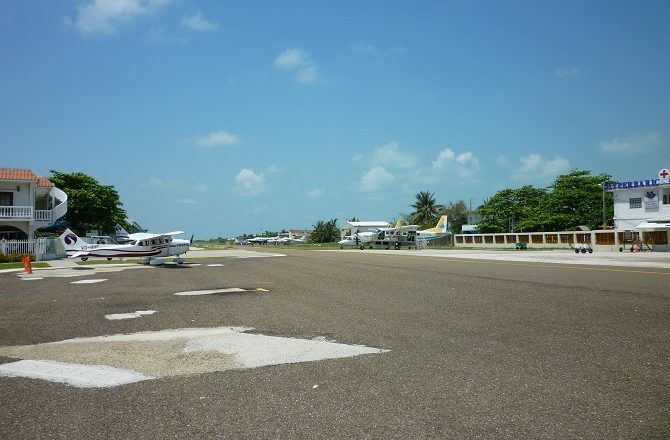 Compared to Corozal, San Pedro on Caye Ambergris almost felt like a real airport; for one thing there was more than 1 plane on the tarmac. There were almost 10. Anyway, after completing the 30 second walk to baggage reclaim, we waited a couple of minutes for our bags which we then wheeled all of 10 metres to our waiting taxi. Where are those porters when you need them, eh? Onward journey time from San Pedro airport to the Phoenix Resort? That took less than 5 minutes but I’m sure I could have walked it in not much more. 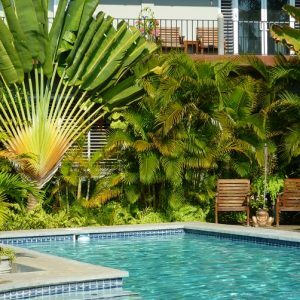 So, less than an hour after leaving the lovely Almond Tree Resort in Corozal we were checking in at the equally lovely Phoenix Resort on Caye Ambergris. It might not have been 11.30 in the morning but, after such a stressful journey, who was I refuse the complimentary rum cocktail on offer?